Recent events on “Game of Thrones” have taken the spark out of the Red Woman, Melisandre. Her champion, Stannis, has been killed in battle. Her faith in the Lord of Light was shaken again when Jon Snow revealed that he saw nothing after his death. And what was most shocking for HBO viewers in Episode 1 of Season 6, when she took her necklace off, her true form as a decaying old crone was revealed. Melisandre was once the true force behind one of the five factions in the War of the Thrones. Now, she’s just a broken woman in Castle Black quietly awaiting Jon’s orders while getting glared at by Brienne for murdering Renly Baratheon with shadow magic. But now a new Red Woman has entered the game in Meereen. Her name is Kinvara, and her full title is a mouthful: High Priestess of the Red Temple of Volantis, the Flametruth, the Light of Wisdom, and First Servant of the Lord of Light. 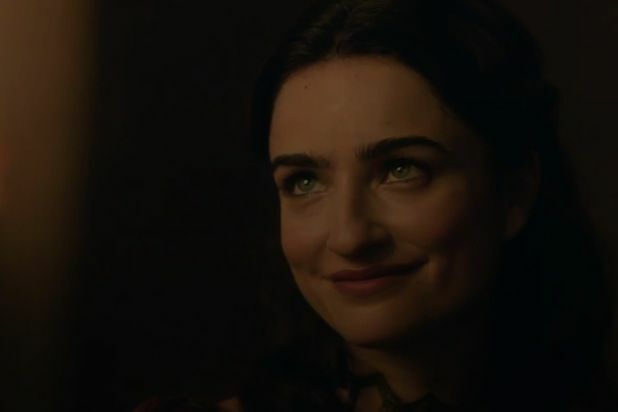 Kinvara bears a striking similarity to Melisandre, or at least how Melisandre was before Stannis fell. She burns with a quiet yet raging confidence, bears a cunning smile at all times, and knows just what to say to cut those who question her down to size. Varys experienced this firsthand when Kinvara told him she knew about the sorcerer who castrated him … and the voice that spoke back to him from the flames that day. Kinvara is a bit of a surprise for the entire “Game of Thrones” fanbase. Unlike most characters, she doesn’t come directly from George R.R. Martin‘s books. Instead, she’s based on a male character named Benerro, who like Kinvara, is the High Priestess of Volantis. Both Benerro and Kinvara also believe that Daenerys is the reincarnation of Azor Ahai, the hero of the R’hllor faith whom Melisandre believed was Stannis. XUnlike Kinvara, Benerro is extremely ugly, bearing pale skin and gruesome tattoos on his shaved head. Maybe Kinvara is only hiding how hideous she really is. She’s also wearing a necklace similar to the one that Melisandre wears to keep her looking young. Could Kinvara be hiding her true face too? Their biggest similarity, though, is that they both plan to use Daenerys to convert the people of Essos to their faith. In the books, the slavers and rulers of the free cities are powerless to stop Benerro from rallying the poor and enslaved against them. Don’t be surprised if Kinvara and her followers do the same on TV.